(Bloomberg Opinion) -- The biggest thing underpinning Tesla Inc.’s valuation is the promise of growth. And the biggest head-scratcher to emerge over the course of January concerns how that growth is being funded. Bonus: On Wednesday evening’s earnings call, the company managed to not so much bury the lead as entomb it. Almost two weeks after the electric-vehicle maker announced it was laying off 7 percent of its workforce, Tesla released its fourth-quarter results. While earnings missed the consensus figure, they were positive and revenue more than doubled versus a year before. Growth like that in a scale-manufacturing company requires a lot of spending, and Tesla did spend a lot ahead of it, building manufacturing lines and other infrastructure to launch the Model 3. You may recall that previous quarter of low capex was one when CEO Elon Musk wanted to prove a point to Wall Street skeptics. Today, with a $920 million convertible bond falling due within weeks and Tesla having insisted it doesn’t need to raise more equity, the company’s cash balance is under the spotlight. Tesla made a point of saying it has enough cash to pay off the bond (the conversion price is about 16 percent higher than its current stock price). Free cash flow clocked in at about $910 million in the quarter, more than double the consensus estimate. Of the difference, more than half related to capex being way below expectations. A year ago, Tesla’s guidance was for capex in 2018 to be a bit higher than the previous year’s figure of $3.4 billion. It ultimately came to just $2.1 billion — almost exactly the same as cash flow from operations. Similarly eye-catching is what has happened to operating expenses. 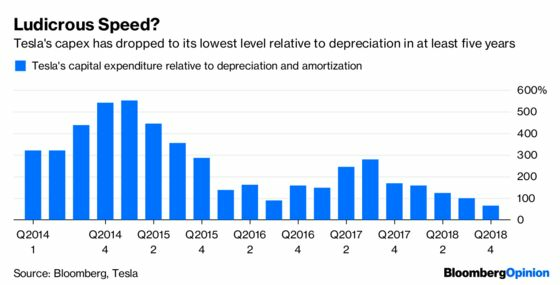 Tesla’s sales, general and administrative expense figure in the fourth quarter of $667 million was the lowest since the third quarter of 2017, when deliveries were less than a third of the latest quarter’s level. The bullish interpretation, and the one the company gave Wednesday evening, is a massive gain in efficiency. And you would expect some economies of scale to kick in with production having risen quickly. Indeed, this was the argument put forth in the announcement and on the call by CFO Deepak Ahuja — or, more properly, retiring CFO Deepak Ahuja. Tesla saved the news of Ahuja leaving the top finance job for the end of the call, after the questions were over (I thought it appropriate I follow suit). Given the slew of managerial exits over the past year, not to mention the “funding secured” fiasco that happened less than six months ago, you might have expected Tesla to get to that news about its CFO a little sooner on the call. But no. Instead, we have a company seemingly on the cusp of sustained profitability and global expansion that has also slashed its workforce and spending and is now bidding farewell to its CFO. Truly astounding.